Take the Cuesta College entrance closest to Morro Bay. Turn at the signal and go about 40 feet and turn right. Do not enter the Cuesta College campus. You will encounter a closed gate a couple of hundred feet down the frontage road. After you unlatch the gate and pass through, please be sure to close the gate and latch it. If you should find the gate already open, please close it. Go about ½ mile on old paved road. Make a left turn on dirt road at the cattle gate with a small yellow sign with black letters “EFR OPEN”. Go on the road through fence (if electric cable is up, stop, disconnect, drive through and re-connect). 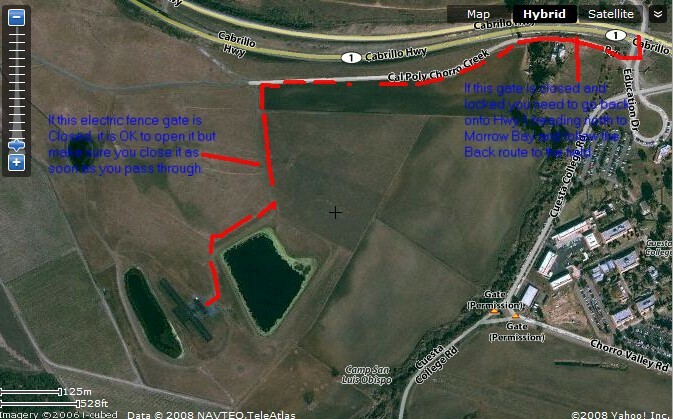 Drive through second cattle gate and keep to the right side of the pond. Just past the pond the road drops down and you’re at the EFR flying field.